In France, since December 24th 2006, any device or accessory in contact with drinking water meant human consumption must be ACS certified (ACS = Sanitary Conformity Certification). 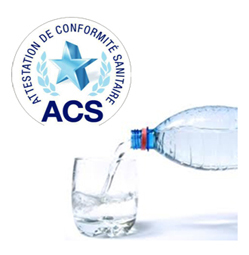 In France, since December 24th 2006, in compliance with the decree of May 29th 1997, any device or accessory in contact with drinking water meant human consumption must be ACS certified (ACS = Sanitary Conformity Certification). It is important to know that certain materials and objects when in contact with water meant for human consumption may affect its purity and its organoleptic, physicochemical or microbiological characteristics, resulting in sanitary risks to consumers! The non-compliance of the ACS standard during an inspection of the French DGCCRF Departement results in fines, products recall, and even penal sanctions. To meet the ACS standard, ATMI was the first manufacturer to develop float switches and level regulators constructed with special materials, all of them ACS certified. Please note that taking into account that health is an important issue worldwide, it is most likely that each country may have a similar certificate. For this reason, we recommend you to contact your local authorities to find out more information about a sanitary certification requirement. !